You are at:Home»Herbs»Juglans regia Linn. Latin name : Juglans regia Linn. Description : The fruit is rich in protein, and high in potassium and other minerals such as zinc and iron. The fruit is alterative, antiseptic, aphrodisiac, a brain tonic, cholagogue, demulscent, emollient, expectorant, mildly laxative, nervine and possesses stimulant properties. Because the fruit is similar in shape and appearance to a human brain, it has traditionally been believed that eating it would help to improve concentration and memory. Useful in sexual debility and calms hysteria. The bark of the root is being used for massaging of teeth and gums (Dr Younis Munshi, J&K). Recommended Dosage : 10 to 20 g powder. 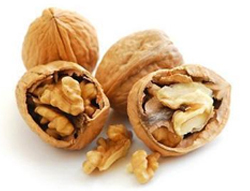 Contraindication : Persons allergic to tree nuts should avoid Walnut.